Norman was born in Wrexham, North Wales and, after early piano lessons, had organ lessons and in his teens and became a church organist. He had his first encounter with the cinema organ in 1969 when he started as the ABC Minors’ Organist at the ABC Regal, Chester. This lasted until 1967 when ABC took their organs off the maintenance list and subsequently sold them. During the early ’60s he had further tuition from Charles Smitton and made his first radio broadcast in February 1959 from the Plaza, Birkenhead as the week’s guest organist on Sam Costa’s Lunchtime programme on B.B.C. Radio 2. It is now over fifty years since he first started as Organist/Musical Director at the Floral Pavilion Theatre, New Brighton, Merseyside where he accompanied many well-known stars. 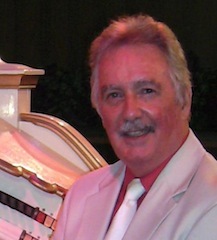 Norman was organist for Bedford Cinemas, Liverpool between 1963-1973 and has made BBC Radio Broadcasts from The Plaza, Birkenhead; Marston Green, Birmingham; The Granada, Kingston-on-Thames; The BBC Theatre Organ and the Astra, Llandudno.